[Vision2020] In celebration of . . . But, it was two and a half years later before the start of the freedom celebration. It has remained one of the great mysteries until this day. This was supposedly the first one of the conspiracy theory nexus. One of the more popular stories, but who was the source? Of all the dirty tricks, this one was the most rotten. Many good people in Texas remained without freedom and singing the blues. Stormed the shores of a Texas town called Galveston. And this time he brought along enough Union troops to make the people heed them. The news of this day finally spread all over the nation. So, from their home state they started to flee. These challenges came from making decisions and environmental changes. When people once enslaved could finally sing their freedom tune. The adults were eating and drinking while the children were playing. It was one of the happiest days many of them remembers. Let the shouts of freedom for all make a holy sound. 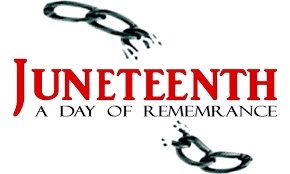 “Forever and ever all Americans will celebrate Juneteenth, the freedom holiday”!